Good morning friends! Mornings are the topic this morning. (Let's see how many times can I use the word morning in this paragraph...). I have always been a night owl. When in doubt, I stay up late and get up late.... it's just the way I am wired I guess. However, this semester, my schedule has forced me to adjust my habits. I have night class 4 days a week and morning classes 3 of the days. My night owl tendencies would leave me with zero sleep if I continued to follow them. Therefore, I made a 2018 resolution to become a better morning person. So far, it's going pretty well. As much as I hate waking up in the morning, I love how productive it makes me feel. I get so much more accomplished. This is a good habit to set now because it will serve me much better in the professional world... there are also studies about how the most successful people are morning people. Let's hope they are right... 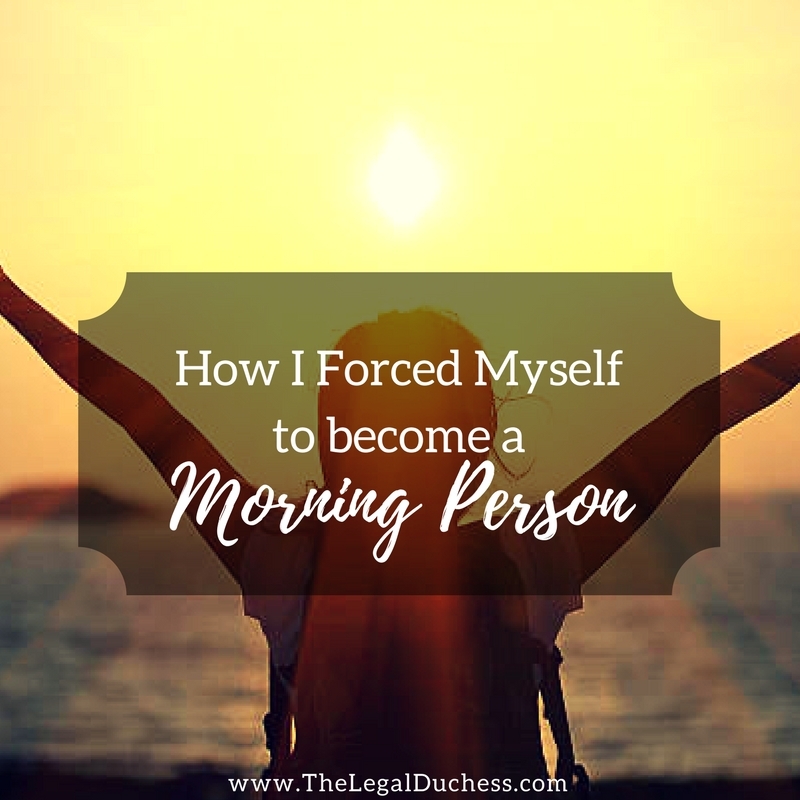 Without further ado, here are my tips on forcing yourself to become more of a morning person. Yes, this is a no-brainer. However, it is also the first step to being a better morning person. I have always been a night owl. That is when I am naturally most productive. However, the older I get, the more I have realized that being a morning person is a great habit. With my schedule this semester, it pretty much forced my hand. I had to be productive in the mornings because my evenings are filled with night classes and if I saved all my homework for after my night class, I would never get to see my husband during the week. I have slowly worked my bedtime to be earlier and earlier. I start winding down around 9:45 and I make lunches for the next day, lay out my clothes, take the dogs out, do my nightly makeup routine and settle into bed. I have found that my humidifier with a few drops of a soothing essential oil really helps me to wind down. I usually read a few chapters of a novel on my kindle ( I avoid my phone because the blue light will keep you awake) before my eyes grow heavy and I am usually asleep between 10:30 and 11:00. This means that when my 7am wakeup comes, I have gotten a full 8 hours of sleep at least. I hate cooking breakfast when I first wake up. When in doubt I just skip it which is really unhealthy or eat something really unhealthy like sugary cereal. I have found that having breakfast prepped and ready to go helps me to get up and get a good breakfast even though it's early. My favorite thing to do is to make a huge batch of steel cut oatmeal in the crockpot on Sunday and portion it into daily breakfast sizes. Then in the morning, I just heat up my portioned oatmeal and a hearty, healthy breakfast is ready to go in just a few minutes. Ahh workouts. I have a very love/hate relationship with working out. I have been doing better in 2018... the treadmill in my basement has been a gamechanger. I have been making a point to wake up 30 minutes earlier so I can knock out a run before my day really gets started. It helps me to wake up and get moving. I also feel so productive and positive if I start my day off with a work out- I feel so accomplished! Hopefully, I can keep it up and fulfill my goal of running a 5K in 2018! Some mornings I don't feel like running and I will do a short Yoga session instead. Either way, getting a workout in first thing has been a great way to start off my mornings and make my mornings easier. So this may seem like a weird tip but it has been working for me. I save a little bit of my reading for the morning before my classes. While this seems "last minute" it basically forces me to get up early because I know I HAVE to finish my reading (and I am terrified of going into class unprepared so it is a great reinforcement of getting out of bed and hitting the books). It also serves as a great little review before my class so the information is fresh in my mind. In the same vein as saving some of my reading for the morning, I plan meetings or appointments in the morning whenever possible. This forces me out of bed first thing and then I have the rest of my day after that engagement is completed. This keeps me from falling into the temptation of staying in my cozy warm bed because I have nowhere to go. I am not a natural morning person so I tend to have to trick/force myself into being better at it. I am still working on being a better morning person but these things have certainly helped me improve! !